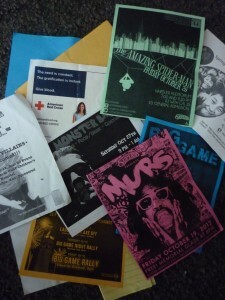 No more flyering on Sproul? We thank and commend in advance all you diligent students that (try to) hand out flyers on Sproul, but today we don’t have all nice things to say about your little squares of paper. If you’re only doing it because your respective club is forcing you to, even though you hate approaching apathetic fellow students, you just might be interested in this. A new phone application is now available called Campus Quad, which updates you on events in and around Berkeley. It lets you browse through a live feed of current events, telling you all the ‘what,’ ‘who,’ ‘when’ and ‘wheres’ you need to attend. Groups can go on themselves and add their own events too. It basically tells you everything you need to know to keep up to date with the latest happenings — without the crinkle and hassle of paper. You may have seen signs on Sproul last week advertising tickets to the Indian Student Association, Hindu Students Council and Indus club’s Raas Garba. The event was held this past Friday, Oct. 12, in Pauley Ballroom. Swarms of people showed up, since you really don’t have to be Indian to enjoy this night of music and dancing. The ballroom was filled with people dressed to impress in their finest cultural getups: traditional saris, shalwar kameez and lehengas as far as the eye could see. Friends and roommates of the subcontinent’s community came out, too, borrowing outfits or pulling out their own get-ups for the festivities. Workshops had been held earlier in the week teaching people the steps to these traditional dances, but there were those who had no clue what to do. However, it was pretty easy to pick up, and once you got the hang of it you found yourself whirling around with the best of them. Raas and Garba are Gujarati folk dances mainly performed at religious festivals and weddings but have also become popularized in everyday life. Garba includes a short series of steps performed repetitively, which last Friday resulted in a huge circle of people bumping into each other in merry chaos. 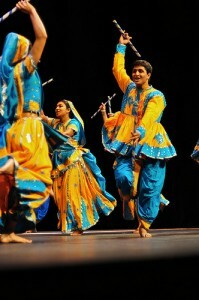 Raas is performed in pairs with dandiya sticks in each hand. This proved slightly less chaos, but people still ended up losing partners and pairing up with strangers to stay in the game. There were of course experts scoffing lightly at the inexperienced, but this was rare, and all were welcomed. Don’t know the steps yet? Come on, we’ll teach you. Don’t know what the heck to do with these sticks? There’s a group in the corner there learning together. There were even snacks like samosas to purchase when a break was badly needed from all the twirling and excitement. With food, colorful clothes, vibrant music and tons of dancing, it was an event to leave everyone smiling. If you didn’t catch it this year, check it out next year. 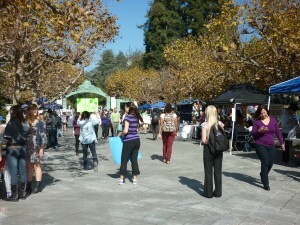 It’s an annual event and one that would be great to experience at least once during your time at Cal.